Kem Reat Viseth, center, head of the government committee in charge of election monitoring, speaks during a media briefing on the participation of observers, in Phnom Penh, Cambodia, July 24, 2018. Cambodians vote Sunday for all 125 seats in the country's National Assembly, with Prime Minister Hun Sen's Cambodian People's Party largely expected to stay in power. The party has won the four previous elections, held at five-year intervals. The major opposition Cambodian National Rescue Party disputed the results of the 2013 election, accusing the ruling party of fraud and refusing to enter parliament to claim its 55 seats. The boycott set off widespread protests against the government that resulted in some violent crackdowns on demonstrators by security forces, and the evacuation of the square in Phnom Penh where the protests were centered. The movement finally ended in July 2014, when the opposition party met with government officials and agreed to enter parliament. Since then, the opposition party has been dismantled. Opposition leader Sam Rainsy was stripped of parliamentary immunity in 2015 on defamation charges. He is barred from returning to Cambodia or running in elections. In February 2017, Rainsy turned over leadership to his deputy, Kem Sokha. Kem was arrested in September 2017 on suspicion of planning a U.S.-backed revolution in Cambodia. Two months later, the Cambodian Supreme Court dissolved the opposition party. A poster of FUNCINPEC Party is seen along a street in Phnom Penh, Cambodia, July 17, 2018. While 20 parties are expected to run in Sunday's parliamentary election, the CNRP was seen as the only serious threat to Hun Sen's party and leadership. Supporters of the opposition are urging voters to boycott the process. The United Nations has criticized the election as fundamentally flawed because of the legal action against the CNRP and its leaders. The United States and the European Union have withdrawn funding for the election. Cambodia's government said about 220 election observers from 52 countries will be on hand to watch for irregularities in Sunday's vote. But critics say many of the observer groups have ties to the ruling party. Chandanie Watawala, an executive with the Asian Network for Free Elections, told Japanese broadcaster NHK Wednesday that the observers cannot be trusted to conduct proper election monitoring because of their ties to the government. On Wednesday, thousands of members of Cambodia's armed forces staged a show of power at a sports stadium in Phnom Penh, displaying anti-riot gear and assault rifles. Cambodian forces used such equipment in a crackdown on anti-government protesters in January 2014. The daughter of Kem Sokha told Reuters news agency that Wednesday's demonstration of power shows "there is evidence that the election is not only being conducted without a viable opposition, it is also conducted under threat, forcing them to go to vote in a fake election." 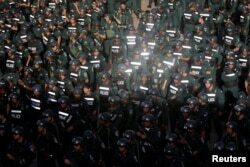 Phnom Penh Police Chief Chuon Sovann told Reuters that security forces will be deployed across the capital city to maintain order during Sunday's vote. He said police will stop any protests or anyone urging others not to vote. Cambodia has also cracked down on independent media in the past year. The Cambodia Daily newspaper announced in September that it would go out of business after getting a $6.3 million tax bill, which the paper's publishers said was politically motivated. The crackdown has also affected dozens of radio stations, including the Phnom Penh bureau of Radio Free Asia, which also closed in September. Two journalists who formerly worked for Radio Free Asia were arrested in November and accused of espionage under a law that criminalizes the transmission of information to a foreign state if it could be seen as harmful to national security. The two journalists were denied bail in April and are believed to remain in custody while awaiting trial. If found guilty, they could be sentenced to up to 15 years in prison. Meanwhile, Hun Sen has three sons who are seen as the heirs to his political legacy. The oldest, 40-year-old Hun Manet, serves as deputy commander of the army, ranked as a four-star general. Thirty-six-year-old Hun Manith is an intelligence chief, and Hun Many, 35, is the youngest member of parliament and runs the youth wing of the Cambodian People's Party. His organization, the Union of Youth Federations of Cambodia, is one of the groups monitoring Sunday's election.